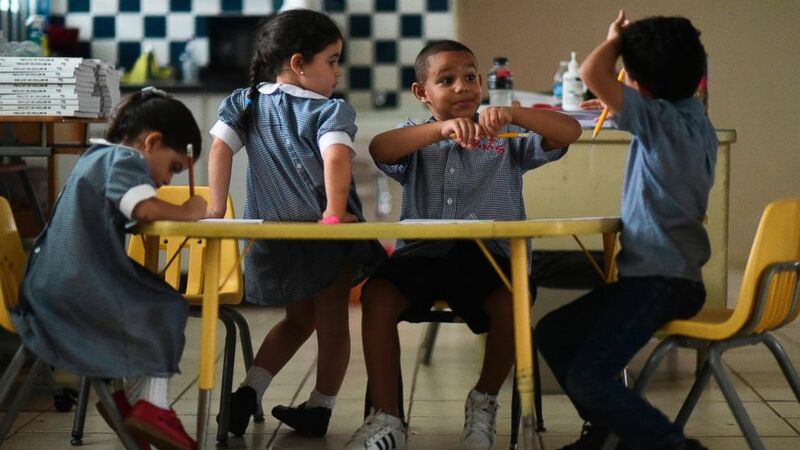 Enrollment in schools in Puerto Rico is way down since the storm. The Puerto Rico Governor’s Office announced on Monday that the island will be receiving $589 million in federal disaster assistance from the U.S. Department of Education as the island continues to recover from the ravages of Hurricane Maria last fall. The federal agency announced Monday it would be disbursing a total of approximately $693 million to Puerto Rico, California and Texas to aid in disaster recovery. The money granted to Puerto Rico is to assist in the rebuilding process of the education system following Hurricane Maria. "This economic injection by the federal government will be key in the recovery process for the Department of Education. It will benefit both the teaching staff, the student body and the non-teaching staff to fully recover the normality in the education that is taught in the education system," Rossello said in a statement. (Ramon Espinosa/AP) Efrain Diaz Figueroa, right, walks by his sister's home destroyed in the passing of Hurricane Maria, in San Juan, Puerto Rico, Oct. 9, 2017. The funds are just the first in a multi-phased process, according to the U.S. Department of Education. A total of $2.5 billion will eventually be awarded. "As communities get back on their feet in disaster affected regions, we continue to support them in every way we can," said Secretary Betsy DeVos in a statement. "This additional funding will ensure students, teachers and staff have ongoing access to the services they need to fully recover and rebuild." The Puerto Rico Department of Education told ABC News in recent weeks that 283 schools are slated to close because of declining student enrollment following Hurricane Maria. A spokesperson for the department says there are 319,000 students on the island compared to 346,000 enrolled students as of May 2017. The department projects that there will be 311,000 enrolled students this August. Half of schools on the island are at 60 percent of capacity. (AP) In this Oct. 13, 2017 file photo, children discuss their thoughts about Hurricane Maria at Ramon Marin Sola Elementary School in Guaynabo, Puerto Rico. 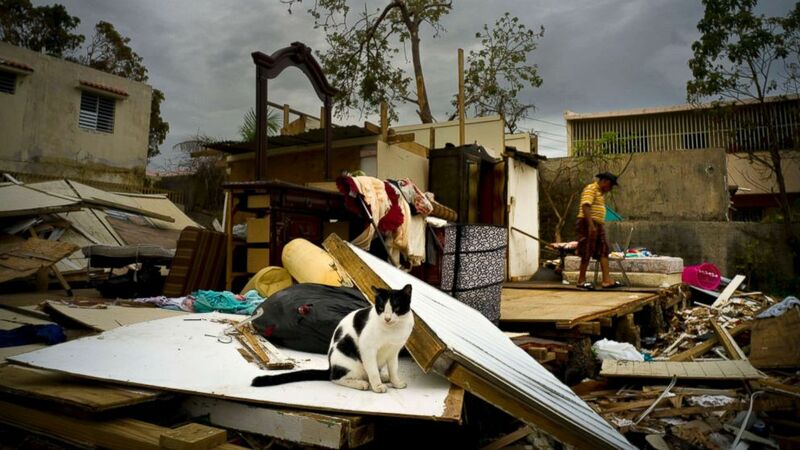 Puerto Rico continues to recover from Hurricane Maria, which hit the island as a Category 4 storm on Sept. 20, and leveled unrivaled destruction on the U.S. territory. The official death toll from the storm is 64, though studies, including one by The New York Times in early December, showed over 1,000 people more than usual died on the island following the storm. The whole island was without power for weeks and only stood at 68 percent in mid-December, according to the Puerto Rico Power Energy Authority (PREPA). Just two weeks ago, the entire island lost power for over 24 hours when construction crews accidentally damaged the power grid. 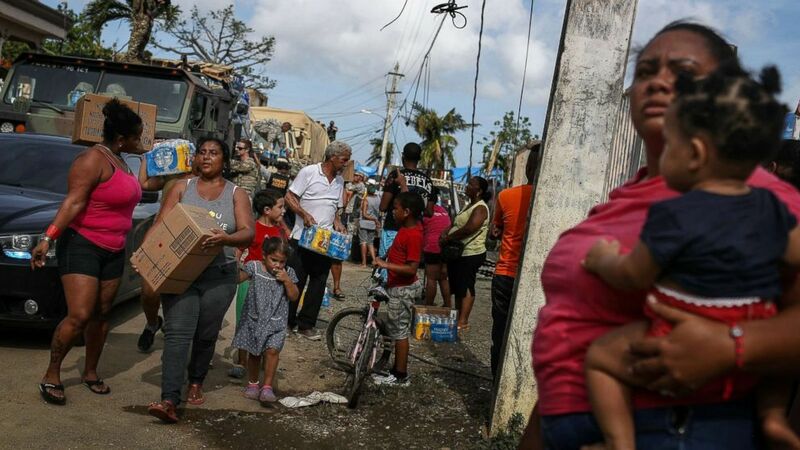 (Mario Tama/Getty Images) Residents gather to receive food and water from FEMA in a neighborhood without grid electricity or running water on Oct. 17, 2017 in San Isidro, Puerto Rico. California's Department of Education will receive just over $14.3 million to help address damage caused by the 2017 wildfires, while Texas received over $89.4 million to address damage caused by Hurricanes Irma and Harvey. Harvey, especially, was damaging to the Houston area. The storm killed 39 people, dumped 51.88 inches of rain in nearby Cedar Bayou, Texas, and caused $97 billion in damages, according to Moody's Analytics.